There’s no denying that One World Observatory has some of the most incredible views of New York City – you literally cannot get any higher (except by helicopter of course). On a clear day, visitors can see up to 50 miles away. In celebration of summer, the Observatory is offering $25 tickets for use anytime between today and August 31st using the code SUMMER. The observatory is situated at the 100, 101 and 102 floors of One World Trade Center, the tallest building in the Western Hemisphere. A partial view from the panoramic view from One World Observatory. Photo courtesy One World Observatory. Not only that, the elevators, which whisk you up 1,250 feet above New York City, are the fastest in the Western Hemisphere, taking only 46 seconds. Within the Sky Pod elevators, you can witness the evolution of New York City’s skyline from the 1500s to today on floor to ceiling LED screens that wrap around the elevator. The visualization combines 35,000 different objects and references and nearly 2,000 historical images. 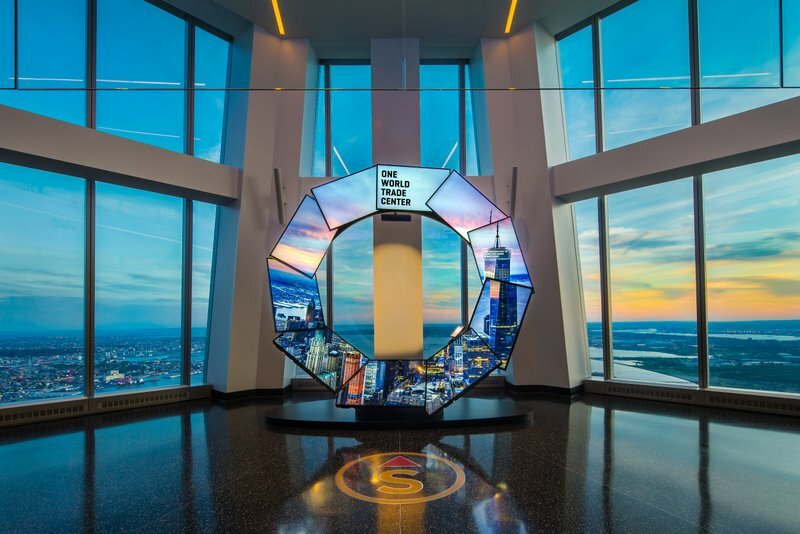 Some other fun amenities within One World Observatory is the Global Welcome Center, which shows where visitors to One World Observatory come from around the world and how many miles they’ve traveled, created using geo-positional data relayed in real time from ticket scans. An installation called Voices, which leads you towards the Sky Pod elevators, features video interviews of the men and women who constructed One World Trade Center, a condensed version of the 25 hours of interviews taken. You then walk through a recreation of the Manhattan schist bedrock atop which One World Trade Center sits upon, the original rocks date back 450 million years. Up top, besides the view, there’s a Sky Portal, a 14-foot wide circular disk that shows the city streets in high definition, 100 floors below in real time, and City Pulse Ring that shows the news from around the city, annotated by an in-person concierge who provides more information to the guests. And don’t forget! For the next 48 hours, the Observatory is offering $25 tickets for use anytime between today and August 31st using the code SUMMER!